Lightweight Windsor style charm comes to the kitchen counter with our Amish Bent Plain Leg Low Barstools. Steam bent bow with bent feather spindles sits on a scooped seat. 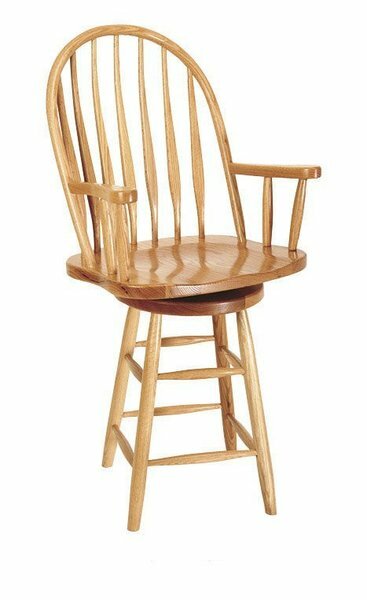 Plain, straight legs are charming and fit a cozy country style kitchen easily. DutchCafters is home to solid wood custom furniture. Bring home the barstools that work best and start enjoying the comfort and style of Amish furniture today. Thanks for shopping with us! Height from Floor to Top of Seat: 24"
Height from Floor to Top of Back: 43 ¾"
Arm Height on 24": 32"
Arm Height on 30": 38"